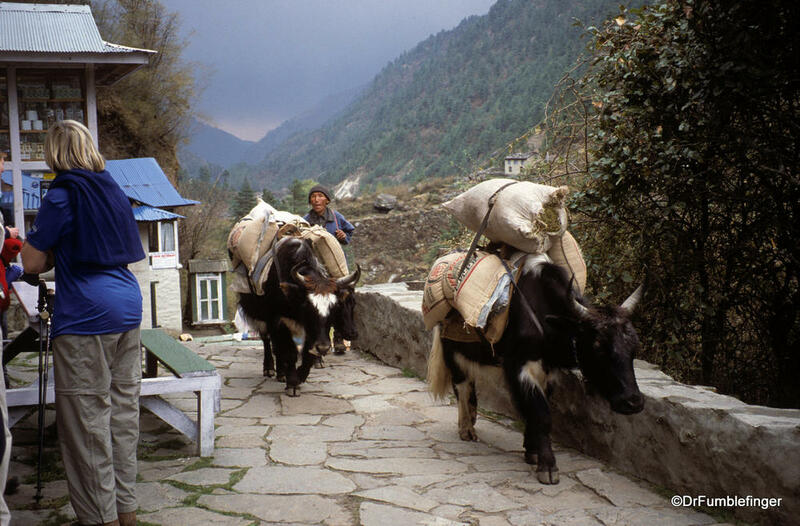 One of the most memorable places I've ever visited was the Khumbu region of Nepal, home of the friendly Sherpa people. The main town in this region is Namche Bazaar, the solution to this week's travel puzzle. Congratulations to PortMoresby who was the only person to solve the puzzle. I suspect Jill had a pretty good idea where Gumbo was but didn't submit the answer. Namche Bazaar is not an easy place to get to. You don't just drop by. 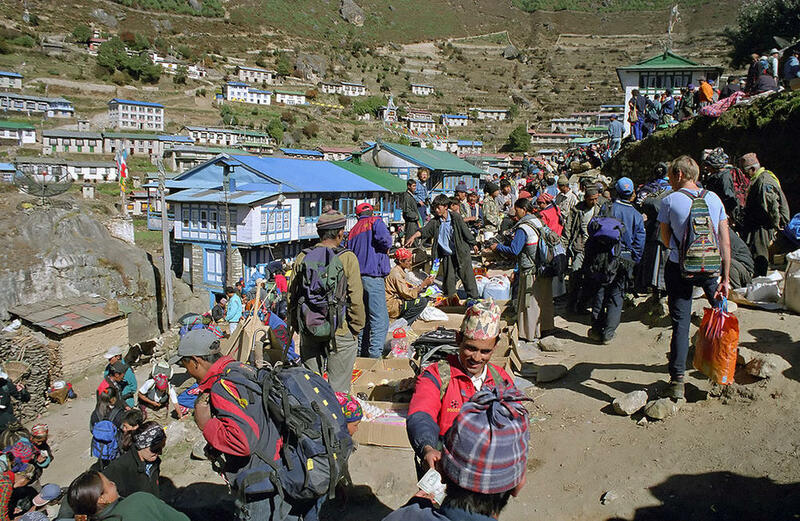 Most people fly to Lukla from Kathmandu, where they start a one to two day trek to Namche Bazaar (depending on how fast you go). 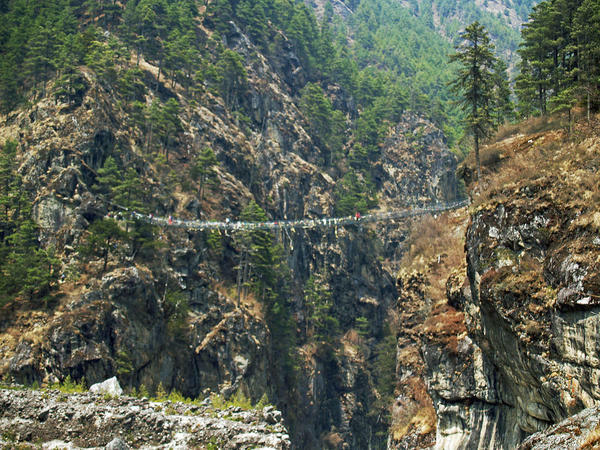 This is the route those going to the Everest Base Camp in Nepal take, gradually acclimatizing as they ascend. 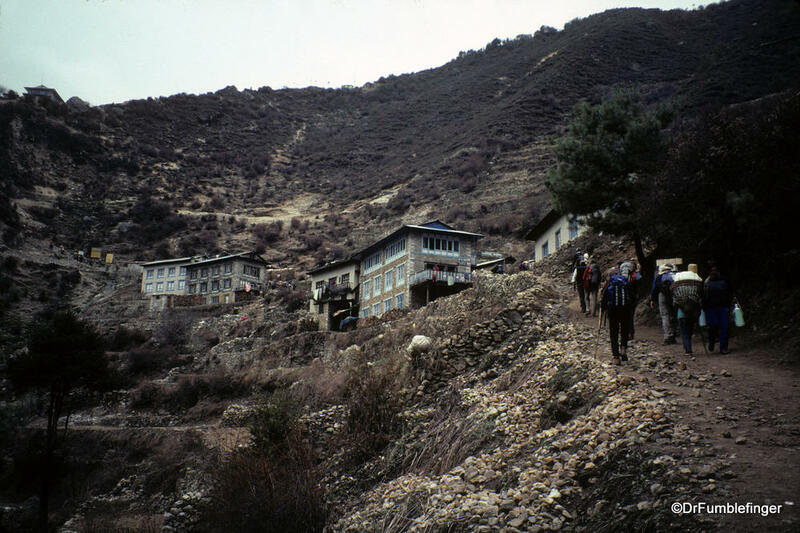 We spent three nights in Namche, two as we ascended the Khumbu, one on our return. We didn't go all the way to Everest Base Camp, an experience that frankly doesn't interest me. Seeing the towns, farms and villages of the area and meeting its people were what I was there to experience. The region became famous in 1953 when Sir Edmund Hillary, a New Zealand beekeeper and mountain climber, was the first to successfully climb to the summit of Mt Everest thereby forever changing human history. The tallest mountain in the world had been conquered. A highlight of my visit to Nepal was to hear Sir Edmund, then a somewhat frail elderly man, give a brilliant talk on his ascent to the summit, using the Kodachrome slides he had taken along the way (the talk was at the Yak and Yeti hotel in Kathmandu, where Sir Edmund waited for his son to summit the mountain). Lasting almost 75 minutes, it remains one of the most fascinating lectures I've ever heard. 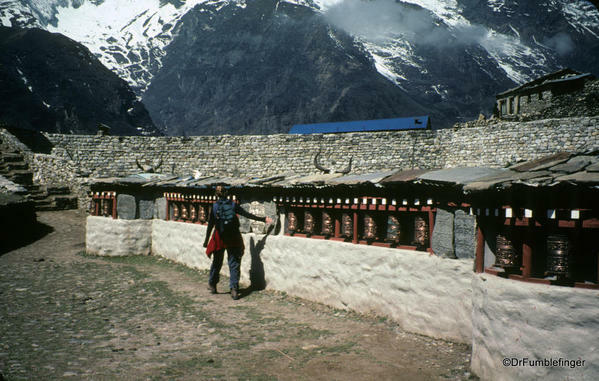 Sir Edmund is deeply loved by the Sherpa people for all his generosity to them (via the Himalaya Trust) over the years. The walking is challenging as the pitch of the trails is steep. The air is thin, so you need to take your time and stay hydrated because altitude sickness is a real risk. And you need to watch out when you cross the suspension bridges as herds of cattle can sometimes appear from nowhere and cross while you're on it (hint: hang onto the suspension cables and let them go by). ..
One of our guides during this part of the journey was famed and accomplished mountaineer, Conrad Anker. A gentle, soft-spoken (and incredibly fit) man, he is well known for having discovered the long lost body of British mountain climber, George Mallery, who died on the Tibetan side of Mt. Everest. There has been controversy over whether Mr. Mallory reached the summit of Everest in the 1920s. It was Conrad's opinion that he did not, given the state of climbing and climbing gear during the time he made the climb. We will never know, but I tend to agree. 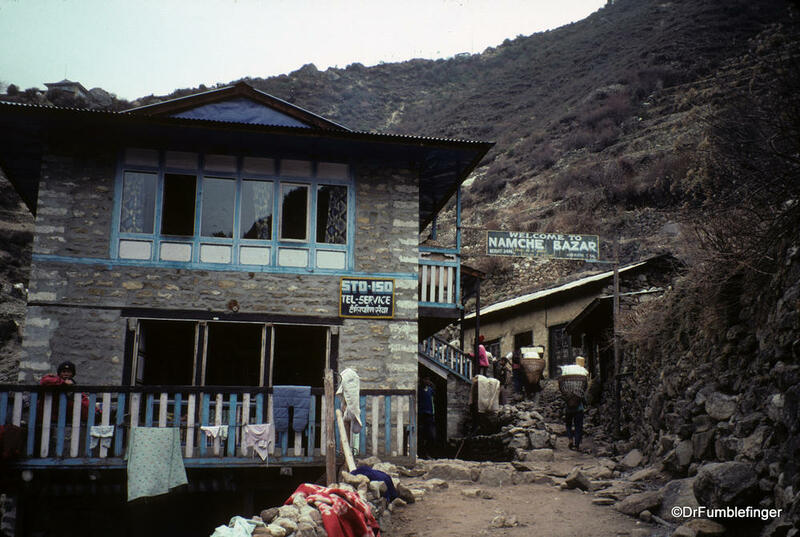 A highlight of our stay in Namche Bazaar was having butter tea (made with yak butter) at the home of one of the Sherpas who had helped Sir Edmund achieve his historic climb. This Sherpa and his wife were a wonderful and sweet couple. They have a daughter who married a man from Denmark, and the only long journey they ever took in their lives was to visit her in the strange flat land of the Danes. It was the first time they experienced trains, the first time they experienced many adventures, like being able to swim in a pool -- something you don't think about is that the water in the Khumbu roars; there is no safe place to take a dip (besides which it would be too cold). 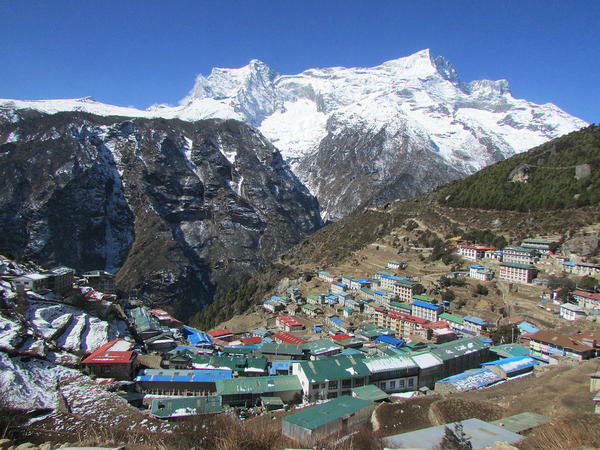 The town has a beautiful setting and the surrounding Khumbu is awe-inspiring! It was from the ridge above the town that we had our first view of Everest, standing tall, a constant plume of snow and ice blowing from its top in the jet stream. Namche Bazaar is situated at 3,440 meters (11,286 ft) and higher as the town fills the sides of a rounded hill. 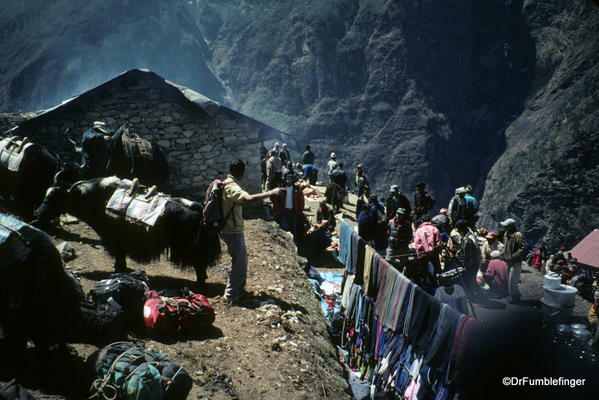 It is the main Sherpa town and tourism and its related industries is the main trade (there are banks, "hotels", bakeries and restaurants, expensive internet cafes, mountain outfitters, medical care clinic and so on). It has less than 2000 permanent residents. 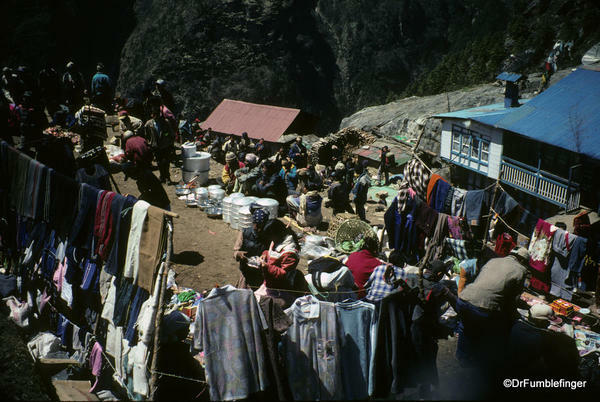 Namche is the most expensive place in Nepal, not a complete surprise because of how difficult it is to get goods there, at least three times as expensive as Kathmandu. 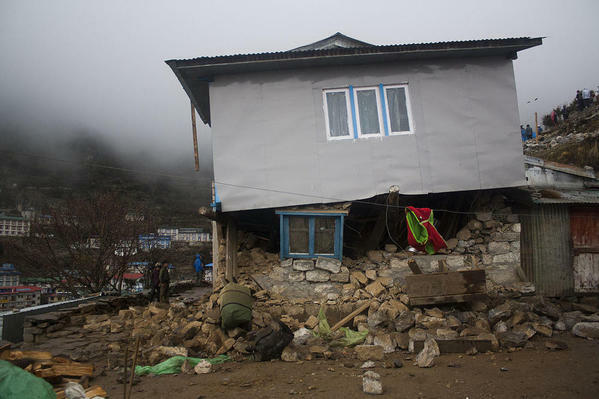 Like much of Nepal, the town suffered significant earthquake damage in 2015. Thanks for posting this piece on one of my favorite areas of the world. Lovely photos. You capture the beauty and majesty of this sacred region that is changing so fast. May they recover from the earthquakes.